Another newer build of Windows 8 has been leaked. This time, it’s of Windows 8 Ultimate M2 (Milestone 2) with build version number of 6.2.7955.0 with full build string of 6.2.7955.fbl_srv_wdacxml.110228-1930. The build is thought to be a M3 build but has now been said to be pre-M3, with M2 ends with build 7950 but M3 only starts from build 7970. Thus, the leak is considered to a pre-M2 which lasts from build 7955 yo 7969, and also to be the very last build of M2, but it can be assumed to be the very first build of M3 too. Nevertheless, it was compiled on February 28, 2011. And the build is from fbl branch which may contains extra kernel debugging tools and guides. Although it’s not off winmain branch, it’s significantly later than Windows 8 M1 build 7850. 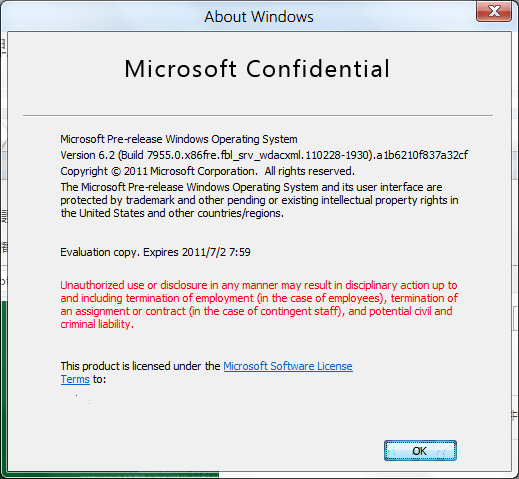 The leaked 32-bit (x86) Windows 8 M3 Build 6.2.7955.fbl_srv_wdacxml.110228-1930.a1b6210f837a32cf ISO image is likely to be a “homemade” ISO, which means that it’s utilizing Windows 7-based setup installer from Windows 8 Build 7850 ISO, but replacing the install.win in the ISO with original install.win from Windows 8 M3 Build 7955. Install.win file contains all the necessary installation files to perform a full installation of Windows 8, so it’s as good as having the complete Windows 8 M3 Build 7955 ISO. Changes that are been made since Windows 8 Build 7850 include Aero is now enabled (previously only Windows 7 Classic is enabled); animated avatar (user tile) support; IE9 is now final version built-in; History Vault to manage files according to timelines by using Shadow Copy; new touchscreen gestures and effects support (only accessible if you have a touchscreen), and user-friendly Black Screen of Death (BSoD) (if you managed to crash the system you will get to see it). Anyway, the new build does not contain new bootscreen or new Aero though. The build expires on (time bomb) July 1, 2011. And user will have 30 days activation grace period before searching for a crack to activate the installed Windows 8. Note the two torrents to download Windows 8 M2/M3 ISO are not the same. The first torrent is the original Private FTP leak named “Microsoft Windows 8 (“Windows 8″ 6.2.7955.0) (Ultimate) (m2).rar”, while the second torrent is made by Torko26, which is also based on Windows 7 based installer from Windows 8 Build 7850 with install.wim from Windows 8 build 7955, but has since removed several unnecessary folders (i.e. kernel debugging tools). 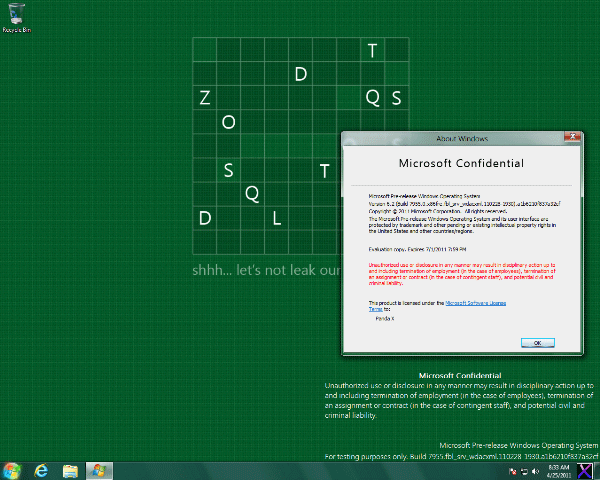 It’s said that 64-bit (x64) Windows 8 Build 7959 may be leaked soon. 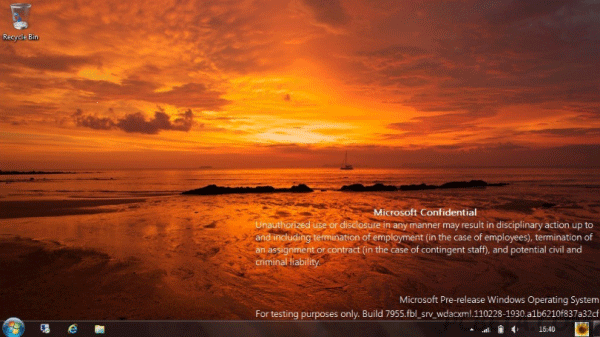 Update: Windows 8 Build 7959 (M3) has leaked.